While this doesn't happen very often, some old school shoujo manga do get redone or revised in some way for a new generation of readers. Below are three such examples. Ribbon Knight is the story of a princess who is raised as a boy in order to prevent an evil man named Duke Duralumon from claiming the throne (as only males can be heirs). Unfortunately, this makes her life very complicated when she falls for a prince named Franz. She also occasionally fights crime under the persona Ribbon Knight. Sapphire: Ribbon Knight involves the "grandchild of the grandchild of the grandchild" of the princess in the original story. On Sapphire's 14th birthday, she comes to find out that she is the surviving princess of a country called Silverland. If she doesn't become Ribbon Knight and protect her birthplace, the sacrifices of her family to give her a future will have been for naught. 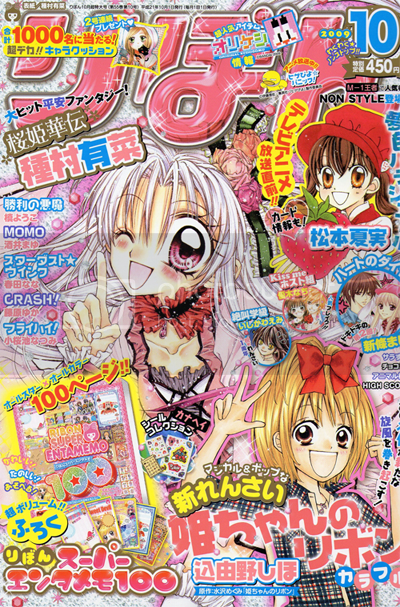 The first series stars a young girl named Himeko. She may be quite the tomboy on the outside, but on the inside she yearns to be feminine and domestic, like her pretty older sister Aiko. One night, Himeko's fate changes. 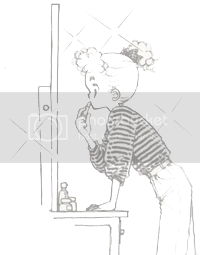 A strange young girl who looks just like her appears at her bedroom window. Erika, princess of the Magic World, wants her twin to test a ribbon she made that allows the wearer to take the form of any living, non-fictional person on Earth for a short period. The second series has things slightly altered. Her crush, Hasekura, has a girlfriend from the very beginning. Himeko meets Erika at school, not in her room at home, and Erika pretty much just puts it right on Hime-chan's head, without explaining first. And Himeko doesn't transform into her sister to "test" the ribbon, but celebrity "Himeka." As the series is very new, I can't say overall how different it will be. Only time will tell! If you would like to read a sample of the first chapter, visit S-Manga! 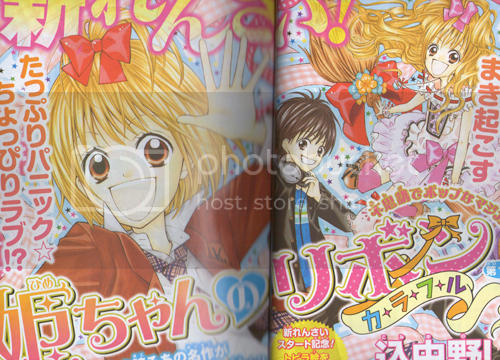 Below are pictures of the Hime-chan revival series debut in the October, 2009 issue of Ribbon. Click them for a bigger view. My apologies that the second is blurry in the middle, it's the best I could do with my scanner. This is only a sort-of revival, maybe more of a shout-out, but I thought I should mention it. This TV drama revolves around a young office worker named Katsuko who likes to escape through the fantasy world of the Rose of Versailles manga, even hearing Oscar's voice in her head inspiring her to do things. When a cost-cutting policy is implemented by the son of the company's president that puts the jobs of coworkers and herself in jeopardy, she decides to stand up in their defense, just as Oscar would. Oh, neat topic! This reminded me of another series, though I had to do a bit of hunting to find it since I'd only seen a news item about it a few years back... Attack No. 1 by Chikako Urano (1968), and its 2005 remake Shin Attack No. 1 by Kanon Ozawa. I've only seen the cover images though, so I have no idea how similar or different the stories are. I wonder what other remakes are out there...! Wow I didnt know Hime-chan was being redone!